Giovanni Brusca (born May 20, 1957 in San Giuseppe Jato) is a former member of the Sicilian Mafia. He murdered the anti-Mafia prosecutor Giovanni Falcone in 1992 and once stated that he had committed between 100 and 200 murders but was unable to remember the exact number. He was sentenced to life in prison in absentia, captured in 1996 and started to cooperate with the authorities. A podgy, bearded and unkempt mafioso, Brusca was known in Mafia circles as Il Porco or Il Maiale, (The Pig) or "lo scanna cristiani" (the man who cuts people's throats). 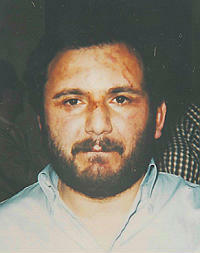 Tommaso Buscetta, the Mafia turncoat who had cooperated with Falcone’s investigations, remembered Giovanni Brusca as "a wild stallion but a great leader.